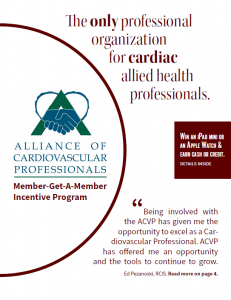 When you recruit new members, you expand both the resources and the networking opportunities of the Alliance of Cardiovascular Professionals. NOW, ACVP IS GIVING YOU MORE REASONS TO REFER. 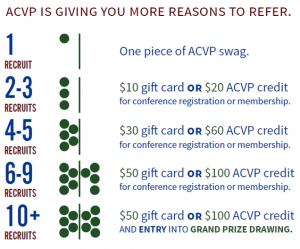 When you refer your friends and colleagues and they join ACVP, you will earn CASH, which will be DOUBLED if you choose to put it towards ACVP membership renewal or regional meetings. 2-3 successful referrals which result in new members will earn you a $10 gift card or a $20 credit towards your next dues payment or ACVP educational meeting fee. 4-5 recruits earns you $30/$60, and 6-9 recruits earns you $50/$100! Plus, each successful referral earns you one entry into a prize drawing for an iPad Mini. And if you recruit 10 or more new members, you’ll earn an entry into an exclusive prize drawing for an Apple Watch! You may recruit members personally or simply give ACVP the contact information of potential referrals via the form below. If you recruit individuals personally, please notify ACVP who you referred by contacting us or using the form below. We will also ask new members who, if anyone, referred them. Credit will be earned for new members who are recruited between now and June 30, 2019. You will receive credit for a successful referral only if the contact joins ACVP. You will receive credit for a referral of a former ACVP member, only if they have been inactive for more than two years. To submit multiple referrals, refresh the page and submit the form again.